"When a Woman Steps Out, where does she really go?" The maid is in tears, the hotel staff are not disclosing the truth and a wealthy banker lies dead in a bedroom of the well-known Metropole Hotel in Leeds. Scotland Yard is investigating, but how can they get any information from the distraught and crying young woman? With her charm and skill at getting people to disclose information, Kate Shackleton gets a summons from her former beau, detective Marcus Charles to help him out. Kate is happy to help but is Marcus really willing to have her skills fully used? Kate Shackleton is a lovely and cultured woman now in her mid-thirties. She had not planned on being a private investigator, but when her military surgeon husband Gerald had gone missing during the Great War in 1917, Kate had been searching for clues to help find him or where he might be buried. Despite her failure at finding Gerald, Kate is getting known for being a sleuth extraordinaire and in the course of helping find other missing people, she even came across members of her own birth family. Meanwhile, former policeman Jim Sykes and now her investigative sidekick asks Kate to take on a case for the very upset and distraught Cyril Fitzpatrick. He loves his young wife Deirdre, but fears she is up to mischief. Where does she really go when she says she is visiting her sickly mom? 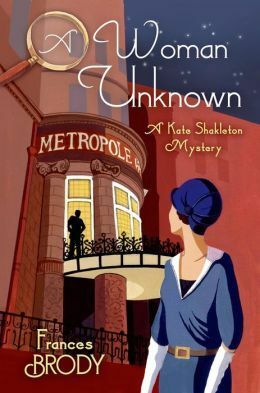 A WOMAN UNKNOWN is the fourth book in British author Frances Brody's Kate Shackleton mystery series set in the 1920s time period. Brody has a lovely talent for giving enough period detail that one feels drawn into the story in a very authentic way, but it is not so overdone that it overwhelms the very savvy and interconnected plotting of many seemingly disconnected events and people in the intriguing story of A WOMAN UNKNOWN. I also find Kate to be a very likeable protagonist. Due to her unique background and excellent observational and listening skills, she is able to move between the various social strata. I particularly like how Brody writes Kate's thoughts in with the dialogue. Kate's reactions to Marcus's style in trying to limit Kate's involvement in his homicide investigation are wonderfully described. Could they ever get together again? While A WOMAN UNKNOWN is part of a series, it is the only book I have read so far, so I can fully attest to be being a very good stand-alone mystery as Brody alludes to past events without over dwelling on them. Brody also is very skilled at describing the attitudes, actions and vocabulary of West Yorkshire society in the 1920s, so the various actions of the characters ring true. I am sure Brody's many fans will relish A WOMAN UNKNOWN as the latest addition and I know I am definitely going to read the earlier mysteries. If you like historical fiction or are a fan of Charles Todd's novels, I am quite sure you will take great pleasure in slipping back in time to an era of change and fine motor cars and finding out more about this very intelligent female sleuth. So, don't wait -- get your copy of Brody's latest Kate Shackleton latest mystery and find out just exactly who and what is A WOMAN UNKNOWN! A winning combination of both intricate plotting and nostalgic post-WWI English country setting, A Woman Unknown will appeal to fans of both classic murder mysteries in the vein of Agatha Christie as well as readers of historical mystery series set in 1920s England, two popular subgenres. The Murder: When a chambermaid enters Runcie's hotel room, she is shocked to find that he is alone - and dead! Suddenly Kate is thrown into the depths of an altogether more sinister investigation. Can she uncover the truth of her most complex, and personal, case to date?